Ancient Castle. Fish Cave Decoration. We will do everything in our powers to sort out any problems that may arise. If we don't know the problem we can't put it right. Give us the chance to correct it! 8.5" Tall Lighthouse. 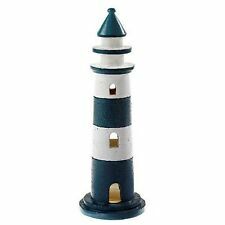 Polyresin Lighthouse. A Great Addition To Any Aquarium. Aquarium Decoration. We w ill do everything in our powers to sort out any problems that may arise. If we don’t know the problem we can’t put it right. Suitable for all aquariums (excludes 15 litre biorb). Ideal for covering the bubble tube on biorb and biube aquariums. Lilac & Pink Fantasy Castle. Our lilac & pink fantasy castle is perched upon a rocky hill. Everyone will love the vibrant colours and playfulness this castle brings to their aquarium. 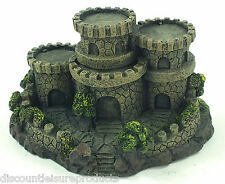 A pretty little castle that will fit perfectly in any small tank. MPN Does not apply Brand Unbranded UPC 191466435007 EAN 191466435007 ISBN 191466435007. 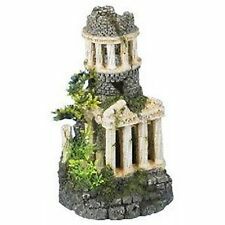 Resin Ancient Europe Castle View Aquarium Ornament View Fish Tank Decoration ! Change your aquarium into a beautiful scenery. Make your aquarium vividly ,add to natural color. 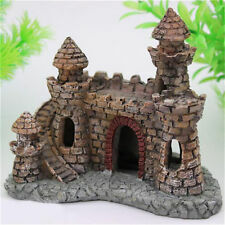 1pc x resin ancient castle decoration. Fish can hide and Pass through the hole and crannies within ,and they won't die, no rot or any algae problems. All girls big or small will love the vibrant colours and playfulness this castle brings to their aquarium. Large Cup Cake Castle. 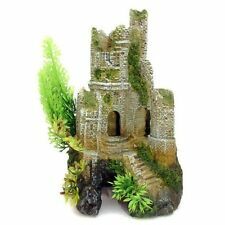 A pretty little castle that will fit perfectly in any small tank. Our pink & delicious looking castle is perched upon a bed of fluffy frosting. Underwater Enchanted Castle. Aquarium Decoration. A Great Addition To Any Aquarium. With Fish Cave. We will do everything in our powers to sort out any problems that may arise. If we don’t know the problem we can’t put it right. Material: resin. Weight: 80g. Color: random. Suitable for biorb 60 litres and other aquariums. Ideal for covering the bubble tube on biorb aquariums. A variety of holes to facilitate the passage of fish and shrimp to create a beautiful underwater world. Ideal for fresh and salt water aquariums, better to decorate your aquarium. The item ismade of resin material, safe in fresh water or salty water and will not fade, very durable. 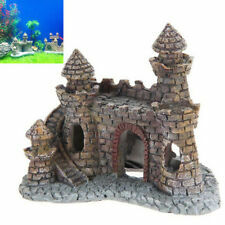 Swim through bridge with castle towers suitable for all aquariums. Middle arch 90mm width cx 80mm height. Zone D - HS, IV41-49, IV50, IV55&56, KA27-28, KW15-17, PA20, PA41-49, PA60-78, PH42-44, ZE, Isle of Man & Channel Islands. The Ideal Decoration for Your Aquarium. CASTLE with CAVE. Safe for all aquatic life. Safe for all terrariums, aquariums, fresh water, salt water. do no harm to fish and other aquatic animals. Fish will be more fun with the mini castle. authentically hand-painted in realistic detail. Size: approx 13x7cm / 5.1" x 2.7" (HxD). This Pineapple House has holes for fish to swim through and explore. 1pc x Pineapple House Decor. Instantly spruce up your aquarium and add a fun decorative look. The Great Wall of China with Fish Cave. Fish Cave Decoration. The Great Wall of China. We will do everything in our powers to sort out any problems that may arise. If we don't know the problem we can't put it right. Uses: fish tank, aquarium, reptile box landscaping shelter house. -- It provides a beautiful and colorful decoration for your aquarium. 1 x Aquarium Decoration. -- It is vividly and color detailed to add lively and natural life to pet. Castle with waterfall, Aquariumdeko . Aquarium decoration. Aquarium de coca Roman, large. Also cute as a decoration for on the window sill. Aquarium cleaning kit. Butterflies made of fabric. Length: 15 cm. Aquarium decoration. Aquarium de coca Roman, large. Aquarium cleaning kit. Hats (w/m) / party hats. Length: about 12 cm. Butterflies made of fabric. Aquariumdekoschiff, grey. Material: polyresin. Yani : Make Your Tank Amazing. Model : Yani HP-AD12. 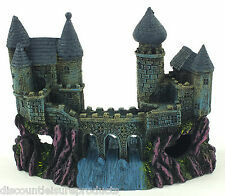 This aquarium decoration features a large grey castle perched upon a rocky hill. 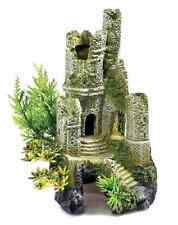 This castle provides visual interest for you and your fish. The cone shaped roof, archways, and stone details give a realistic feel. Aquarium Foods. Aquarium Plants. Aquarium Accessories. Aquarium Shells & Barnacles. Aquarium Pebbles. Aquarium Real Bog & Curio Wood. Waterlife Aquarium Products. Aquarium Water Test Kits. The Ideal Decoration for Your Aquarium. BLUE CASTLEwith CAVE. Safe for all aquatic life. A cool and creepy addition to any aquarium or terrarium helping to give depth and a creepy atmosphere this skull castle is a must buy. The Ideal Decoration for Your Aquarium. CASTLE with CAVE. height: 26 cm. width: 14 cm. The Ideal Decoration for Your Aquarium. GOLD CASTLEwith CAVE. Safe for all aquatic life. Fish will be more fun with the mini castle. authentically hand-painted in realistic detail. Safe for all terrariums, aquariums, fresh water, salt water. do no harm to fish and other aquatic animals. Make your aquarium a living picture. Our goal is. Suitable for use in both freshwater and saltwater.